The Diocese of Paterson was established by Pope Pius XI on December 9, 1937, the same day that the Dioceses of Camden, New Jersey and Owensboro, Kentucky were established. One week later, Bishop Thomas H. McLaughlin was appointed as the first bishop of Paterson, and the former parish church of St. John the Baptist in Paterson was established as the Diocesan Cathedral. Though the Great Depression was nearing an end, the need for human services was tremendous. There were few governmental programs to serve those in need. Lay men and women, clergy and nuns stepped in to serve those who needed help. In 1938, Bishop McLaughlin established Associated Catholic Charities in the Diocese of Paterson, appointing Fr. John Merrick as its first Executive Director. The newly formed Agency was ready to begin work, and on that day the Newark Associated Catholic Charities transferred the Paterson cases (193 children and 60 families) to the new Agency. Miss Helen J. Reed began working in the Agency the next day and was to remain for more than a quarter century, the first of a long line of dedicated professionals who would serve Catholic Charities. The Agency’s first full Report in 1940 revealed 140 families, 242 children, and 35 unwed mothers under its care. Although the Agency had just two divisions, Catholic Charities was in fact multi-functional, striving to meet the varied social needs of the Diocese as they arose. At the end of World War II, Associated Catholic Charities in the Diocese of Paterson was there to help those displaced and resettling because o f the global war. We continued to grow and expand throughout all corners of the Diocese throughout the 1940&apos;s.
In 1954, Monsignor William Wall established the Mount Carmel Guild, providing detoxification and residential treatment for "indigent male alcoholics." Later evolving to Straight and Narrow, this is the longest-running community-based residential treatment facility for those who are addicted to drugs and alcohol in the United States. and vulnerable people. 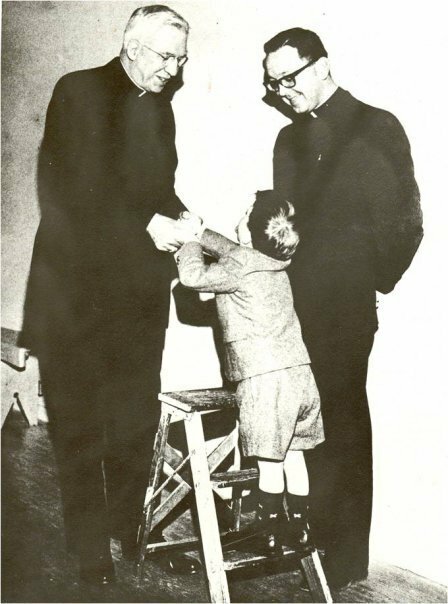 At around this time, the Department for Persons with Disabilities was established by Bishop James J. Navagh. "I know that your zeal for these members of the Church, for whom Our Lord showed a special love, will be extremely beneficial to them and to God’s kingdom," wrote Bishop Navagh, naming Father Jack Wehrlen, from St. Phillip&apos;s Parish in Clifton, as DPD’s first Executive Director. Catholic Charities in the Diocese of Paterson served as an innovator during a time when many children with intellectual and developmental disabilities were institutionalized and forgotten. In 1967, the Gruenert Nursery opened for children with special needs; followed by Camp Alexander, an overnight camp for individuals with disabilities; and later Murray House Group Home in 1971. Murray House is now the longest running residential program for adults with intellectual and developmental disabilities in New Jersey. Hope House was also established in 1971, designed to serve all of Morris and part of Sussex County. Today, Hope House feeds the hungry, provides emergency assistance, prevents homelessness and provides case management services for those in need. In 1976, the Father English Community Center was also founded in Paterson, and designed to help all people, from newborns to senior citizens. The 1980s brought with it AIDS, increased drug usage and the deinstitutionalization of persons with mental illness. Straight and Narrows services were needed more than ever before. They responded to this need by treating those with HIV/AIDS and by opening an Adult Medical Day Care Center. Throughout the 1990&apos;s and into the 2000&apos;s we continued to expand the work we do to help immigrants, refugees, veterans, those with disabilities, individuals struggling with addiction, and pretty much anyone else who came to our door for help. We are also there to answer the call during times of crisis, responding on 9/11 and during the aftermath of natural disasters. We continue our leadership role today, working with state and federal government agencies, service providers, and individuals, to provide a voice for the voiceless. corporate subsidiaries of the new non-profit parent organization - Catholic Charities, Diocese of Paterson. One governing board was established, led by Board President Monsignor Herbert Tillyer. The three agencies will work more cohesively together, while retaining their rich histories of providing service. The future is bright at Catholic Charities!